Liverpool are seriously looking to sign Brazilian international Alisson Becker if reports in Italy are anything to go by. According to il Romanista, Liverpool have offered a huge fee worth €70m plus bonuses to the Serie A club and terms of a contract worth €30m to the goal keeper to secure his signing. The Italian source have covered a comprehensive report and claimed that Liverpool are clearly in pole position (ahead of Chelsea and Real Madrid) to sign the Samba star, whose future could become very clear in the next few days. 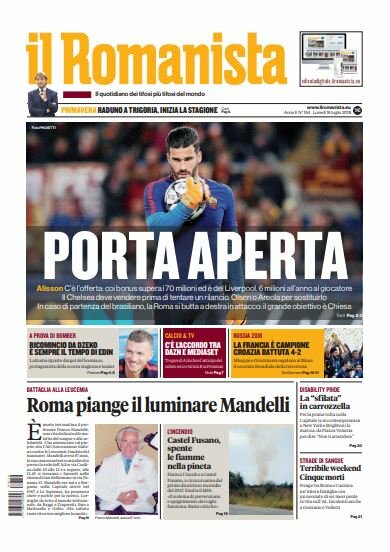 The outlet have further mentioned that in Trigoria, Rome (basically talking about Roma), if there is an offer of over €70m for a goal keeper, it cannot be refused considering the fact that the cash would be utilized to ‘complete and improve the current squad’. It is evident that the Reds need a new goal keeper because the likes of Loris Karius and Simon Mignolet are just not good enough. Chelsea already have a world class shot stopper in the form of Courtois, but as per il Romanista, Real Madrid are looking to sign the Belgian international and therefore, the Blues want Alisson to replace him. If the South American star has to chose between Chelsea and Liverpool, then Klopp’s team is clearly the better option. The Brazilian goalie will be united with his compatriot Roberto Firmino, who netted 27 goals in all competitions for the Reds last season. Also, Alisson will be re-united with Mohamed Salah, who left Roma to join Liverpool last year. More importantly, the former Internacional goalie will be able to play Champions League football if he moves to Anfield. On the other hand, if he opts to move to Stamford Bridge, then he will be playing in the Europa League next season.